Lynyrd Skynyrd was one of the most commercially successful and critically acclaimed Southern Rock groups of the 1970's. Their distinctive triple-lead guitar sound made their songs "Freebird" and "Sweet Home Alabama" American anthems and staples of FM radio. Artists become eligible for induction 25 years after the release of their first record. Criteria considered includes the influence and significance of the artist's contribution to the development and perpetuation of rock and roll. The Foundation's nominating committee, composed of rock and roll historians, selects nominees each year in the "artist" category. Ballots are then sent to an international voting body of about 700 rock experts. The Twenty-First Annual Induction Ceremony was held on March 13th 2006 in New York, the ceremonies were aired a week later on March 21st, by VH1. Once in a while a musical force will burst on the scene and forever change that scene. Lynyrd Skynyrd was such a force. 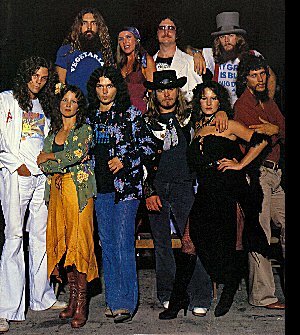 The power that rested in Allen Collins, Gary Rossington and Ronnie VanZant and the rest of the band can never be forgotten or underestimated. To this day, three decades after the tragedy that decimated the original Skynyrd band, millions of fans still buy the records, feel the songs, understand the power. As a way of extending Skynyrd's touch to a wider variety of fans, the Freebird Foundation Inc., a non-profit charity established in honor of Ronnie VanZant, developed this Lynyrd Skynyrd website. Working closely with band members and Skynyrd families, the Foundation has provided the dedicated fan a complete Lynyrd Skynyrd resource. Representing a complete look at Lynyrd Skynyrd's thirty plus year career through rare photos of the band onstage and off, detailed history and biographies of the band members, a discography, a complete song list with lyrics, a showcase of rare Skynyrd memorabilia and much more. The Freebird Foundation was closed in March 2001. However, this website continues to be owned and sponsored by Judy Van Zant for the purpose of allowing fans to learn the history of the Lynyrd Skynyrd Band. You Are Skynyrd Fan To Visit Since August 31, 1996! !